Because they actually made a Samurai Cop sequel and now anything is possible, Dread Central reports that Kickstarter may be about to realize its true potential with a sequel to the sequel to Silent Night, Deadly Night. To be clear, no campaign has been launched yet for the movie, which appears to exist solely in the mind of Silent Night Deadly Night Part 2 star Eric Freeman as of this writing. Yet. So let’s do this, internet. Fulfill your destiny and make Silent Night, Deadly Night, Part 2 2 (a.k.a. 2Silent2Deadly, a.k.a. Silenter Night, Deadlier Night) happen. 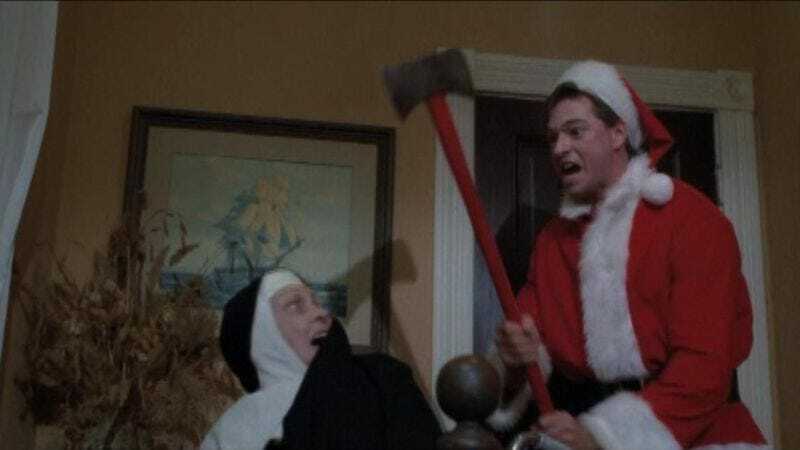 Two-thirds of the movie can be footage recycled from Silent Night, Deadly Night Part 2, because that movie is mostly composed of footage from the first Silent Night, Deadly Night anyway. It’ll be totally meta.